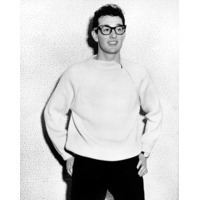 Charles Hardin Holley (September 7, 1936 – February 3, 1959) known professionally as Buddy Holly, was an American singer-songwriter and a pioneer of rock and roll. Although his success lasted only a year and a half before his death in an airplane crash, Holly is described by critic Bruce Elder as "the single most influential creative force in early rock and roll." His works and innovations inspired and influenced contemporary and later musicians, notably The Beatles, The Rolling Stones, and Bob Dylan, and exerted a profound influence on popular music. Holly was among the first group of inductees to the Rock and Roll Hall of Fame in 1986. In 2004, Rolling Stone ranked Holly #13 among "The Fifty Greatest Artists of All Time".